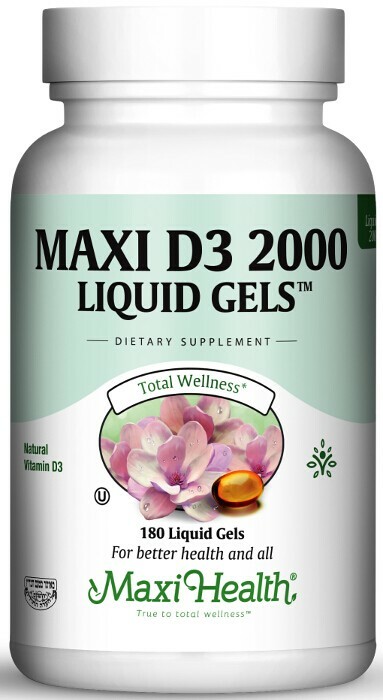 Our new Maxi D3 2000 Liquid Gels™ are your logical source for supplemental vitamin D. Liquid filled softgels offer you faster release and are a desirable alternative for those who have trouble swallowing tablets and capsules. Vitamin D3 supports calcium absorption in the gut and the mineralization of bones. It also supports modulation of neuro-muscular control and reduction of inflammation. Maxi D3 2000 Liquid Gels™ are made with 2000 IU of vitamin D3, the most absorbable form of vitamin D known as cholecalciferol. That’s why you want vitamin D3 rather than any other. Vitamin D is so important that many food products are fortified with it! If your goal is to have a certain amount, you can only really be certain with supplementation. While your body, with enough sunlight can make its own D3, you would need to be in the sun every day. Not only that, as people age, the skin cannot synthesize vitamin D as efficiently. Those who are advised to avoid direct sunlight to protect their skin or keep covered for religious reason, also benefit greatly from supplementation. Try our new Maxi D3 2000 Liquid Gels™ to support your health. Take one (1) Softgel daily with meals, or as directed. Other Ingredients: Organic extra virgin olive oil, modified cornstarch, carrageenan, glycerin, and purified water. This product contains NO soy, wheat, gluten, salt, milk, artificial flavors, colorings or preservatives.